By answering the questions below, AscenDance Project will have the fields necessary to provide you with an accurate quote. Please allow up to 3 business days for someone to get back to you. Thank you for your interest! What kind of event are you hosting? Are there any customized components (music, ceremony, specific ideas) or specific needs for this show? Please provide as much detail as possible. If you are currently unsure of the time frame, please give your best estimate, or provide different possibilities of availability for the most accurate quote. Please provide as much detail as possible. Please indicate whether the performance will be located indoor or outdoor (If outdoor, please note that shaded area is important). Please note that quotes are subject to change based on travel and insurance costs. Would you like us to include airfare and accommodation costs for performers and riggers in the quote? Please list any other information or questions related to travel. Performances range anywhere from minutes to over an hour. The length of the performance is affected by the number of dancers you select, this is indicated in the options below, with the minimum number of dancers required to complete this piece noted. This is simply an estimate and can change based on the specifics of the show. How many performers would you like? 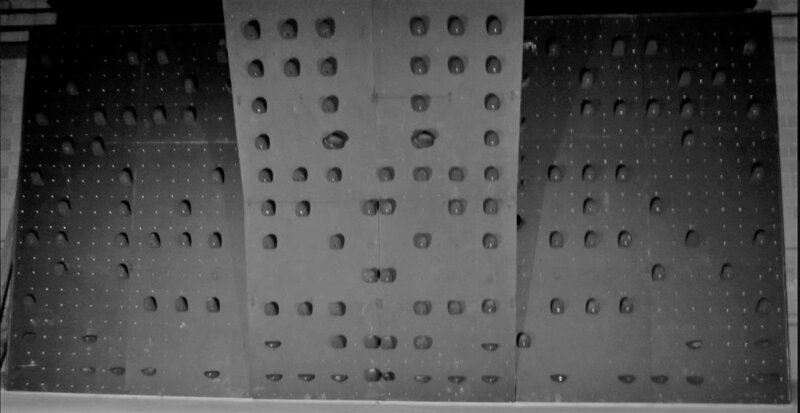 The panels we dance upon form the rock climbing wall. There is the option to have a performance on 1, 2, or 3 panels. Different options are pictured below. If you are unsure of how many panels you would like, you are welcome to select multiple options and we will get back to you with different quotes based on your selections. Will we need to add you as additionally insured on our liability policy? Thank you for your interest! Please allow up to 3 business days for a response. Our entire climbing wall is 24 ft wide and 12 ft high. (Pictured at the bottom). We need a minimum of 3 ft of clearance above the wall.The supporting scaffolding structure behind the climbing wall is 10 ft deep. The climbing wall can also be broken into single sections that are 8' wide and 12' tall. If the event is outside it will be important that the wall will be shaded.